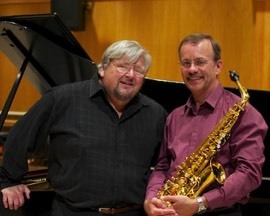 Working with pianist Ivan Rosenblum for over 25 years, as the Wolford/Rosenblum Duo, Dale has premiered many new works including the Sonata for Saxophone & Piano by Gunther Schuller. The Duo has released two compact discs, including Laughter and Tears—A Jewish Saga on the Centaur label. Dale Wolford is also currently a member of the Premiere Saxophone Quartet. Recently he has performed as a soloist with the San Francisco Ballet Orchestra in San Francisco as well as on tour with them to Copenhagen, New York, Chicago, and Los Angeles. He has also performed in the San Francisco, San Francisco Opera and Sun Valley orchestras, as well as with Philip Glass, Bernadette Peters, the San Francisco Contemporary Music Players, Santa Cruz New Music Works, the Morosco Saxophone Quartet, the San Francisco Saxophone Quartet, the Nuclear Whales Saxophone Orchestra and is a frequent guest soloist with area orchestras and bands. Dale has taught at San Jose State University and University of California, Berkeley, Dale has also taught at University of the Pacific, California State University—East Bay, California State University, Stanislaus and Chabot College. In addition he has been a board member for both the California Music Educators Bay Section and the Music Teachers Association of California. His is currently a Yamaha Performing Artist. Ivan Rosenblum, pianist-composer-arranger, taught education and music at U.C.S.C. from 1970-80. He has a B.A. from Queens College, N.Y.C., and a Masters and Doctorate from Harvard University. He studied piano and chamber music with Robert Hagopian and Menahem Pressler, and composition with Hugo Weisgall and Vittorio Rieti. Mr. Rosenblum's compositions have been performed at the University of California, Santa Cruz, The Oakland Museum of Art, and the Berkeley Repertory Theater, as well as on radio stations KPFA, KKHI, KQED and KUSP. As pianist for The Wolford/Rosenblum Saxophone-Piano Duo, he has performed extensively in Northern California and toured Northern Italy. Mr. Rosenblum has also taught at the University of California, Berkeley in their Young Musicians' Program. He is pianist and arranger for the CD Kabarett: Songs of Kurt Weill on Laurel Records. He now lives and teaches in Santa Cruz and coordinates the Santa Cruz Chamber Players' Celebrating Youth Program for talented high-school students.